Shaker Serving Tray with Cherry Band and Cherry Bottom, Size 8. 14-7/8" length, 10-3/4" width, 1-1/4 height. Artisan Crafted in East Tennessee. Lacquer Finish Resists Water, Alcohol, Fruit Juice and Other Common Household Spills. Each Piece is Signed and Numbered. 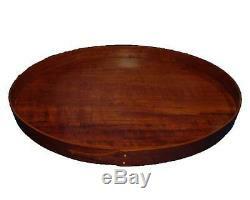 It is doubtful whether any of the Shaker communities ever deliberately made oval serving trays. Most certainly they pulled the lids off larger oval boxes and used them as trays. The swallowtails are held together with copper tacks made on a machine that was making tacks over 100 years ago. The item "Shaker Serving Tray #08 with Cherry Band and Cherry Bottom, Lacquer Finish" is in sale since Saturday, July 30, 2016. This item is in the category "Home & Garden\Kitchen, Dining & Bar\Dinnerware & Serving Dishes\Trays". The seller is "clickerflicker" and is located in Kingsport, Tennessee. This item can be shipped to United States, Canada, United Kingdom, Denmark, Romania, Slovakia, Bulgaria, Czech republic, Finland, Hungary, Latvia, Lithuania, Malta, Estonia, Australia, Greece, Portugal, Cyprus, Slovenia, Japan, China, Sweden, South Korea, Indonesia, Taiwan, South africa, Belgium, France, Hong Kong, Ireland, Netherlands, Poland, Spain, Italy, Germany, Austria, Israel, Mexico, New Zealand, Philippines, Singapore, Switzerland, Norway, Saudi arabia, Ukraine, United arab emirates, Qatar, Kuwait, Bahrain, Croatia, Malaysia, Brazil, Chile, Colombia, Costa rica, Dominican republic, Panama, Trinidad and tobago, Guatemala, El salvador, Honduras, Jamaica.